Talk about a communication challenge-this is certainly one of the biggest! When we are in a relationship with someone (especially our intimate partner or spouse) and we get triggered or upset, the first thing that usually happens is that we shut down to the other person in some way or another. Some of us get mad or just peeved and some of us withdraw, either agreeing to something we don’t want or disagreeing but withdrawing our energy. However you shut down, the outcome is still the same- disconnection. When you shut down emotionally or energetically, you are nowhere close to coming together on an agreement and a way to proceed to resolve the difference when this happens. No matter how insignificant the issue, resentment can build and continue to separate you from the love and connection that you both may want. 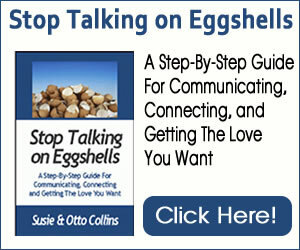 You start doing what we call “talking on eggshells,” not really saying what you mean because irritation seems to be a constant between you. So what can you do when this happens? How can you learn to say what you mean when it’s important to do so and it’s difficult to do so? Although it may seem like the complete opposite of what you might want to do or what might feel natural to do– one of the best things you can do when you’re having a difficult moment in your relationship or marriage is to open, even when it’s difficult to do it. Everything you do either moves you closer to or further from the love that you really want. It’s the choices you make in every moment that make the difference whether you keep a relationship alive or deaden it. And, opening is a choice that you can make. So how do you open up when you’re triggered and feel closed, angry, or withdrawn toward the other person? 1. Own your stories-What is it you are telling yourself about this situation? Are you holding on to being right? Take a moment and listen in on what you are saying to yourself about this situation. Ask yourself what it would mean to get your way or if you didn’t get your way. What are you telling yourself being right or getting your way will prove? 2. Remember that you love or even like this person-What is your desire with this relationship? If it’s connection and love, then bring your thoughts back to why you love this person, even though you may both be at odds at the moment. Remember that you aren’t always at odds (even though you may think you are at the moment) and bring your mind and heart back to times when you were on the same page. 3. Share and listen with love-What is it that you want to share from your heart? Be curious about what you want and also what the other wants. Know that you both have choice and listen and share from that feeling of wide openness. Opening when you are triggered is a choice. You can stay stuck in negativity, possibly harming your relationship and certainly making your life miserable-or you can choose to open to maybe another alternative or way of doing things. The choice is love or distance. Which do you choose?